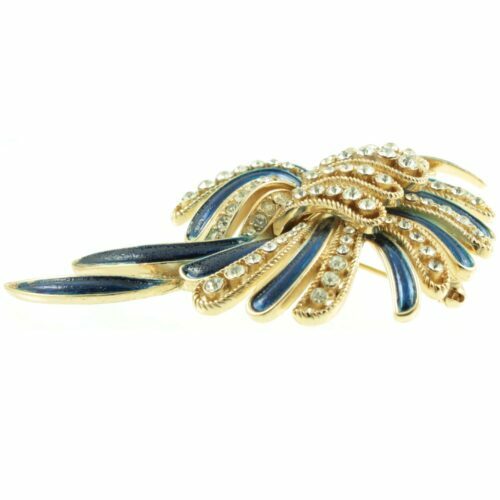 A beautiful 1930`s Trifari brooch. 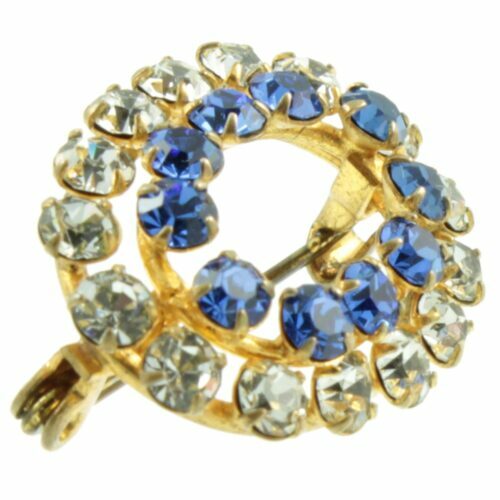 A gold plated spray brooch, studded with clear rhinestones individually mounted in a closed back rub over setting. Each rhinestone frond features a twisted rope finish, which adds texture as well as extra sparkle to the piece. These rhinestone fronds alternate with metallic blue fronds, creating a gorgeous combination of depth and sparkle. 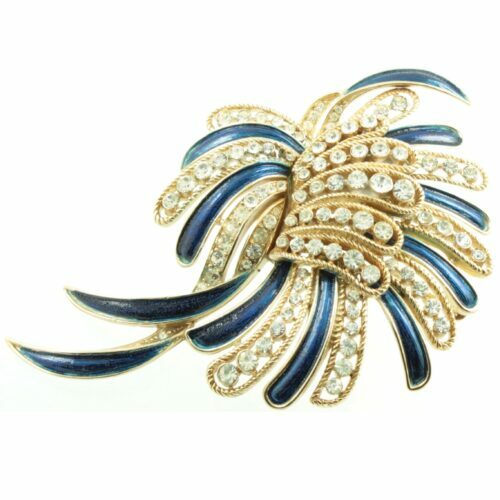 This brooch is signed Trifari and is an original piece of vintage costume jewellery. Size : (L) 51mm x (W) 75mm, weight 33.2g. Period: Art Deco Jewellery ( 1920 - 1935 ). All items are presented in one of our beautiful signature boxes, with complementary delivery worldwide on all orders. An intriguing Art Deco sterling silver Duette brooch. 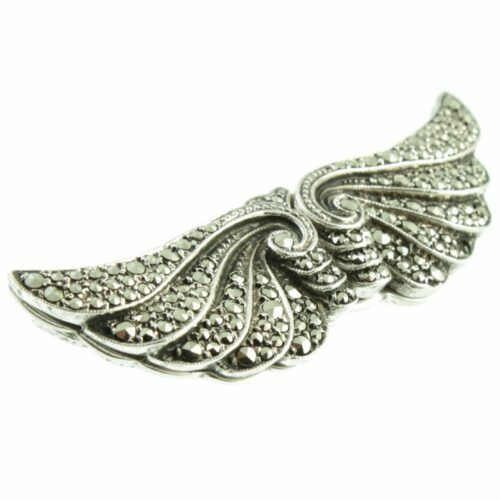 Two beautifully designed wing shaped dress clips with spring mounted clasps, are in perfect working order. Each wing features scrolling detail and is decorated with graduating marcasite stones. These dress clips can be used on their own or if brought together will form a brooch. A genuine and original piece. 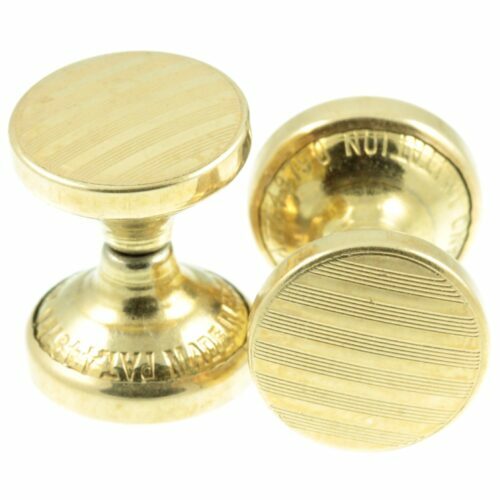 Size : 52mm x 15mm, weight : 20.6g. Period: Art Deco Jewellery ( 1920 – 1935 ). All items are presented in one of our beautiful signature boxes, with complementary delivery worldwide on all orders. 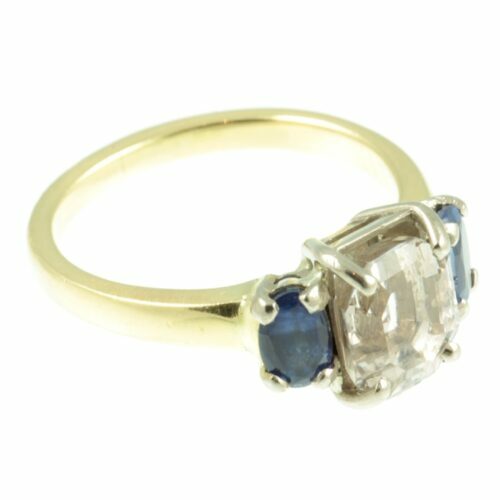 A fabulous Art Deco sapphire ring. The featured stone is a gorgeous pink sapphire measuring 3 carats set in luxurious 18ct white gold by means of a secure claw setting. This Asscher cut pink sapphire has excellent clarity and catches the light beautifully. 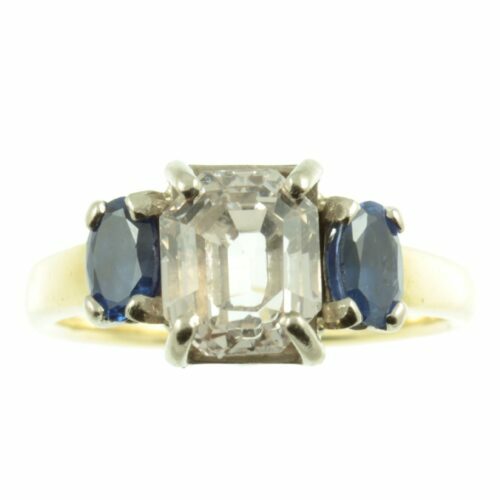 It is flanked on each side by an admiral blue oval cut sapphire, which have a combined weight of 1.20ct. Both of these side sapphires are very well matched and have beautiful colour saturation. 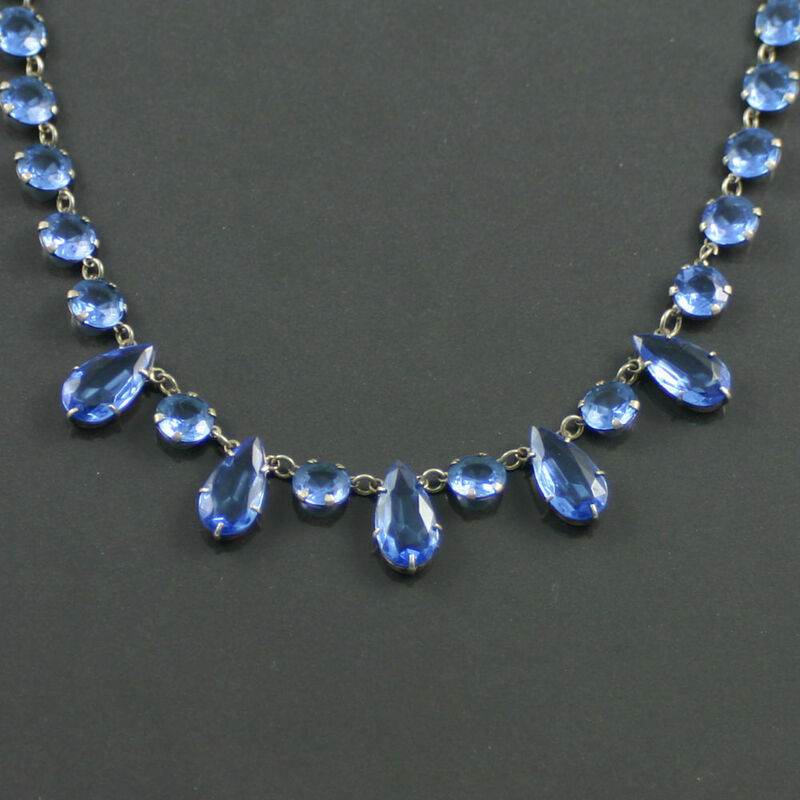 Like the main stone, these admiral blue sapphires are set in 18ct white gold with claw settings. While the band is made from rich 18ct yellow gold. This ring represents quintessential elegance and sophistication. Ring size: UK size P, US size 7.75, width 9 mm, weight 5.9g, this ring can be re-sized free of charge, upon request. Period: Art Deco Jewellery ( 1920 – 1935 ). 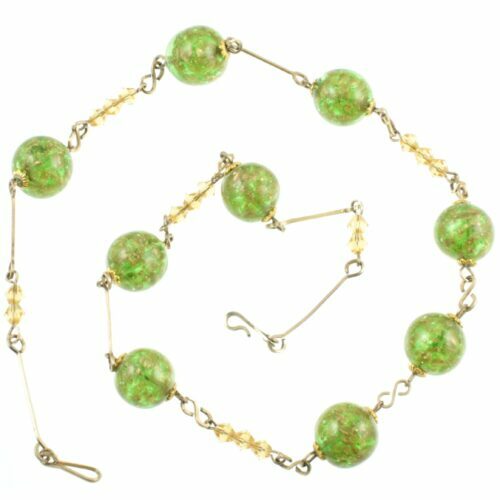 An original Art Deco Czech glass necklace. 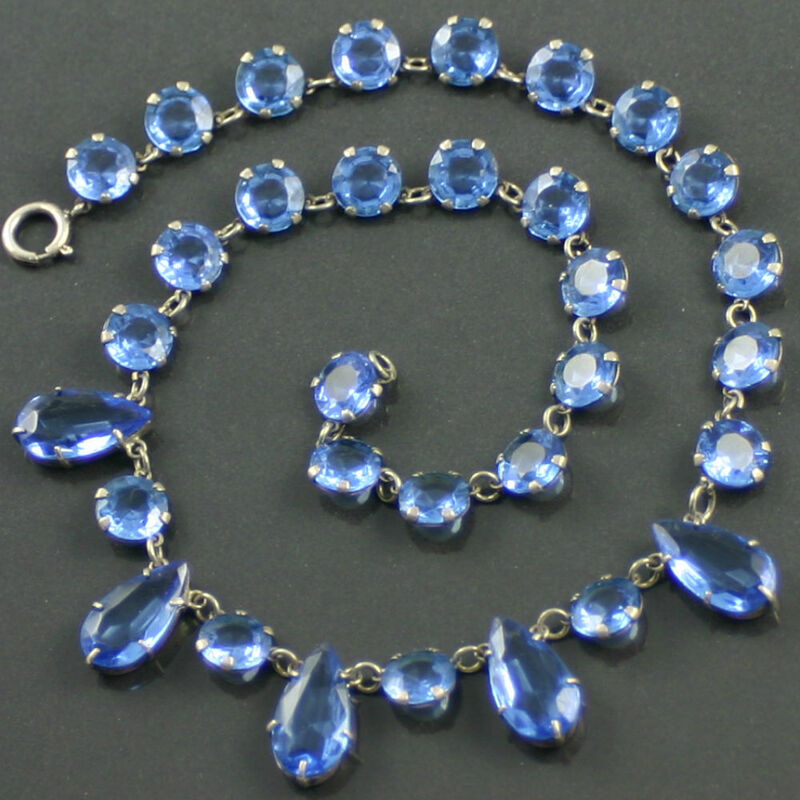 Gorgeous sapphire blue faceted Czech glass, set in silver with a spring ring clasp. A very well-made piece of vintage costume jewellery. Size: 40cm x 17mm, weight 27.4g. Period: Art Deco Jewellery ( 1920 – 1935 ). An original Art Deco flapper necklace. 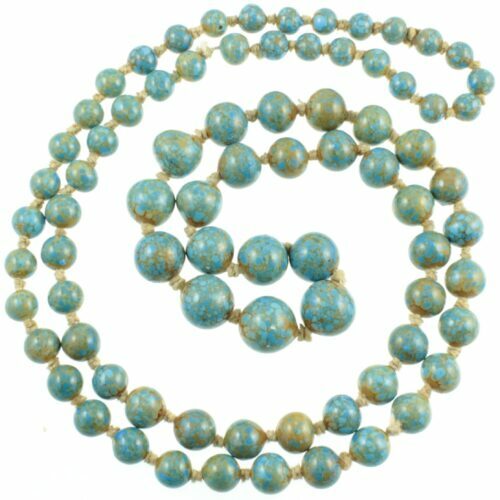 Graduated polished sea sediment Jasper beads have been hand-knotted to form this exotic necklace. 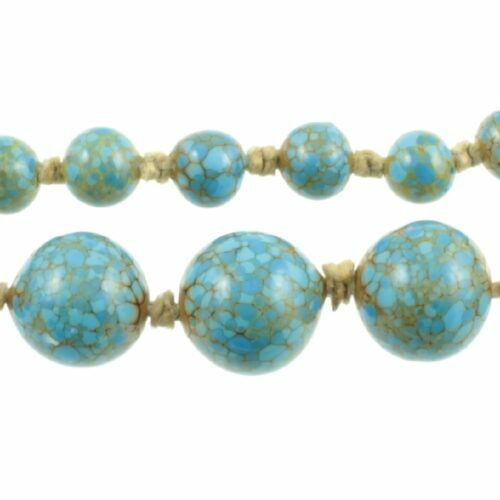 These sea sediment jasper beads have a crackle glaze pattern with hues of turquoise. An iconic necklace of the 1920s. Size: 90cm x 13mm – 7mm, weight 112g. Period: Art Deco Jewellery ( 1920 – 1935 ). All items are presented in one of our beautiful signature boxes, with complementary delivery worldwide on all orders. 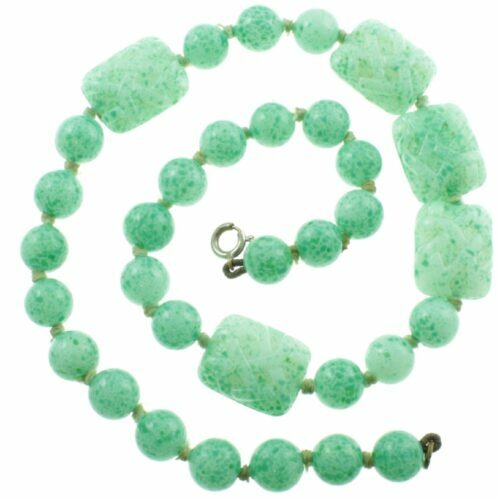 A very pretty aventurine swirl necklace. 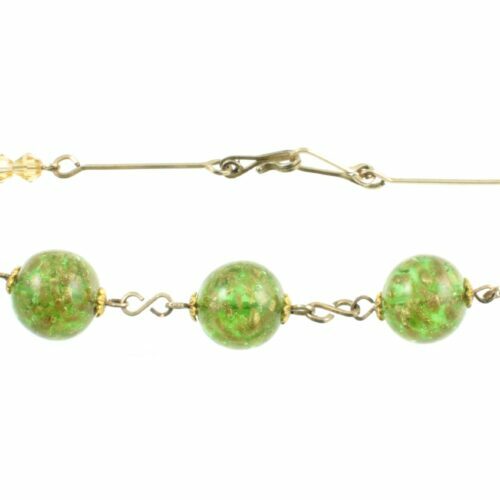 These shimmering glass beads were made by a Venetian artist, who mixed crushed aventurine gemstone dust with molten glass. The necklace chain is made of fetter links with small faceted amber glass pieces intermittently spaced. 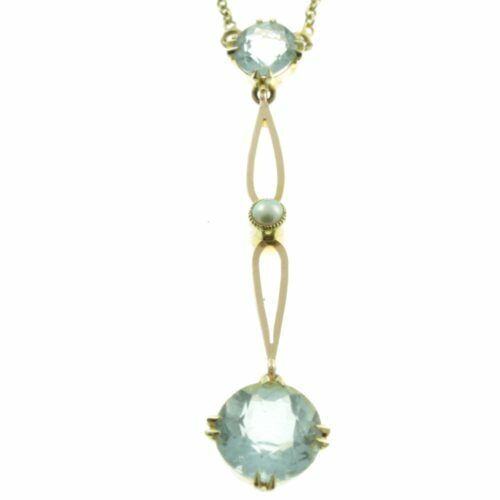 Which gives a further depth to this gorgeous necklace. A fine example of the very high standards to which Venetian artists work. Size : 45cm x 12mm, weight 26.2g. Period: Art Deco Jewellery ( 1920 – 1935 ). All items are presented in one of our beautiful signature boxes, with complementary delivery on all orders. A luxurious Art Deco Jade Necklace. 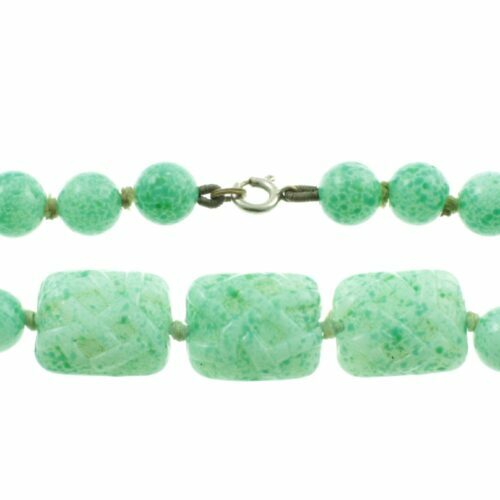 Cushion cut jade which has been hand carved with a lattice pattern, along with spherical jade beads have been hand knotted on a silk thread and securely set to a ring spring clasp. 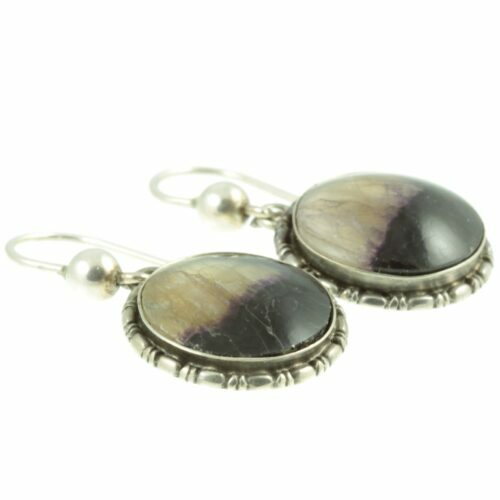 This highly polished nephrite jade has a delicate mottled pattern, which is very well balanced and gives it a visual depth of colour. A classic piece of vintage jewellery. Size : 40cm x 14mm – 9mm, weight 55.6g. Period: Art Deco Jewellery ( 1920 – 1935 ). All items are presented in one of our beautiful signature boxes, with complementary delivery worldwide on all orders. 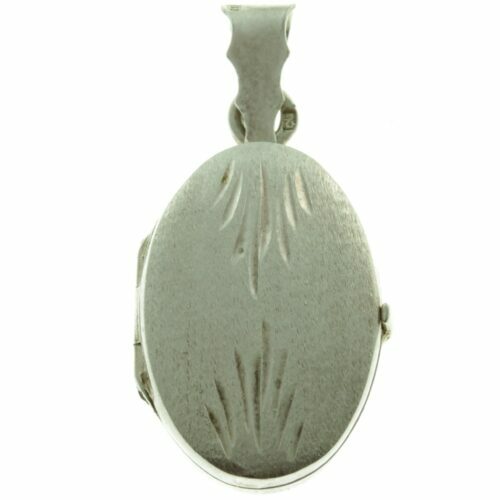 An elegant Art Deco Locket. 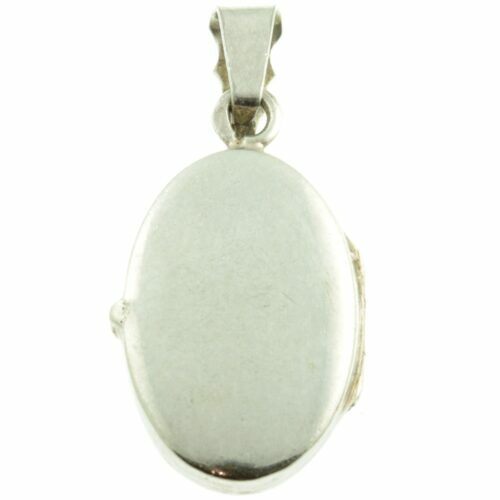 This Italian made sterling silver locket, features geometric engraving on the front of the locket along with a textured finish. While the reverse is polished to a smooth finish. Inside the locket are two compartments in which to place photos/pictures. 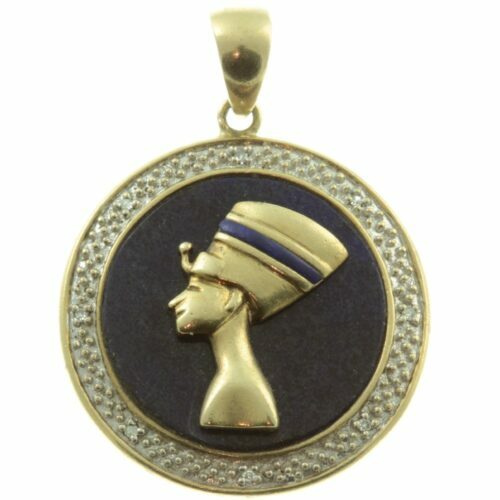 A timeless pendant. 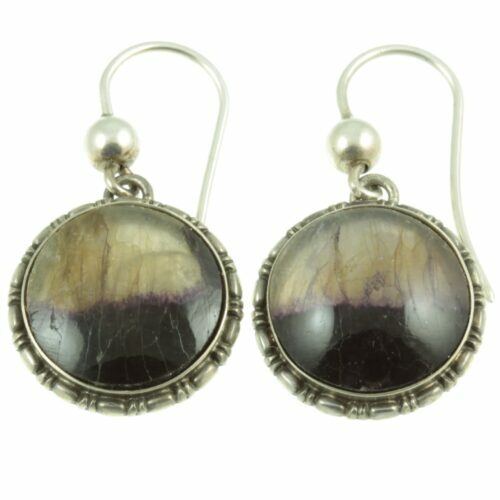 Size: 34mm x 18mm, weight: 6.8g. Period: Art Deco Jewellery ( 1920 – 1935 ). All items are presented in one of our beautiful signature boxes, with complementary delivery worldwide on all orders. 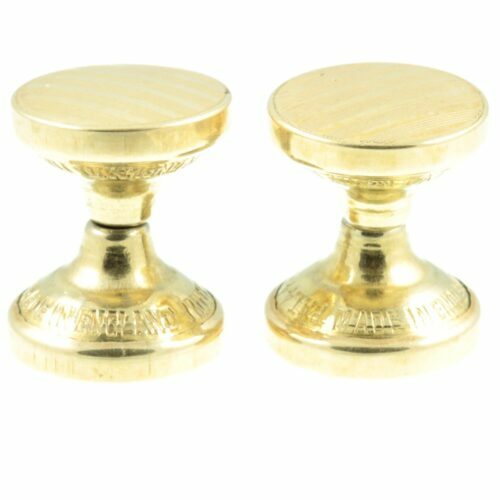 An original pair of Art Deco Cufflinks. A depiction of a horse and rider has been carved into the back of rock crystal and then painted. This technique is called reverse intaglio or Essex crystal as it is also known. The technique was first developed in the mid-1800s and remained popular right up to the 1930`s. 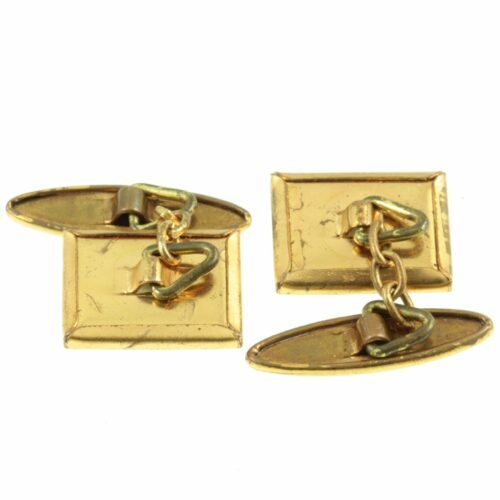 These cufflinks have been mounted in a gold tone setting, with small chains connecting them to torpedo toggles. 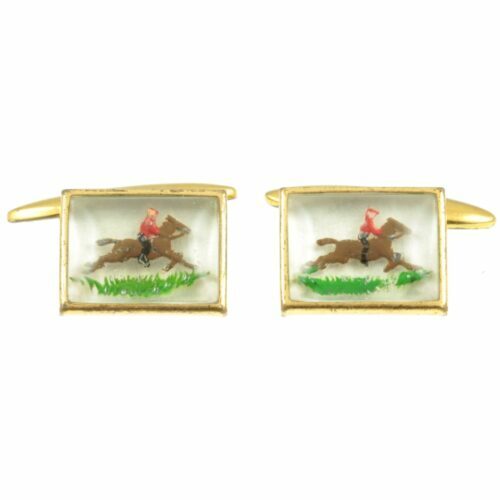 A well made and stylish pair of vintage cufflinks. Size: 13mm x 16mm, weight: 3.3g each. Period: Art Deco Jewellery ( 1920 – 1935 ). 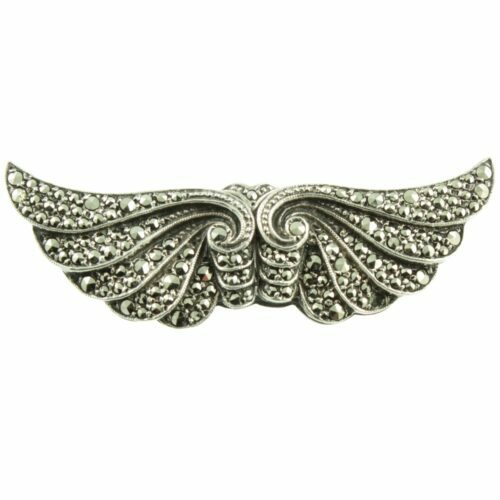 A petite Art Deco rhinestone brooch. 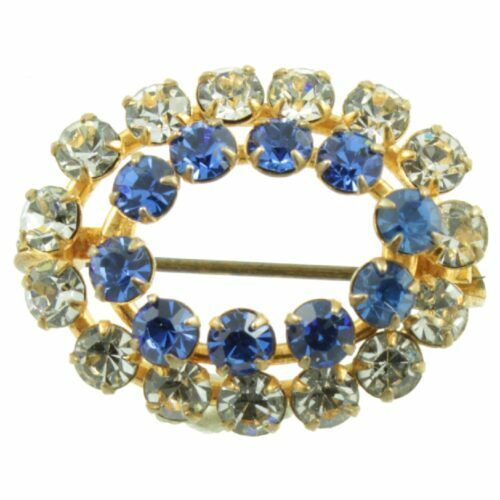 An oval shaped brooch containing two rows of beautiful rhinestones, a clear rhinestone outer row and a sapphire blue rhinestone inner row. 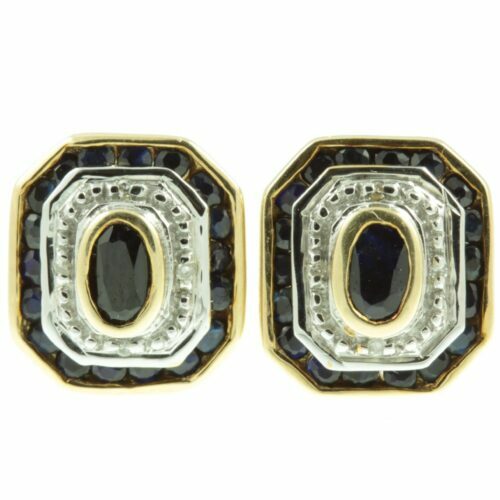 These rhinestones are all securely mounted in a closed back gold tone setting. An original and very well made piece of vintage costume jewellery. Size: 25mm x 20mm, weight: 3.8g. Period: Art Deco Jewellery ( 1920 – 1935 ). All items are presented in one of our beautiful signature boxes, with complementary delivery worldwide on all orders.